Billy celebrated his 24th birthday this past Friday. We did our usual dinner celebration with the family at Red Lobster, Billy's favorite place, on Sunday afternoon. 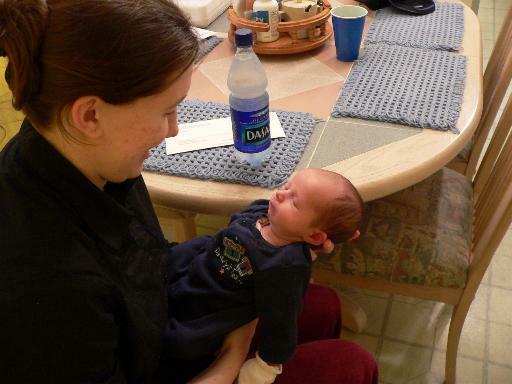 The lovely Lorelai slept through the meal, letting her Mom have a nice dinner. I've gotten to see the baby quite a bit this week since I'm on vacation. 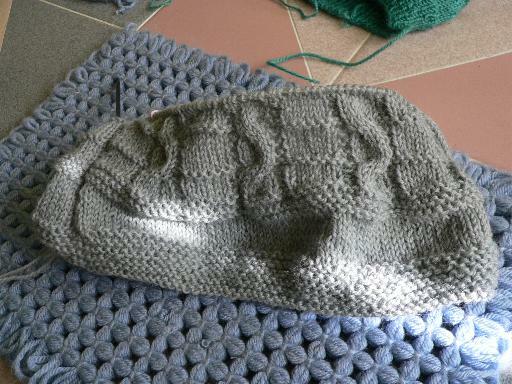 I'm also working on another gansey, knitted in the round. 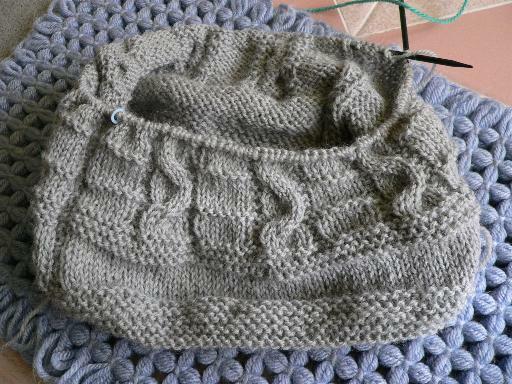 I'm following the pattern in the book, Knitting Ganseys by Beth Brown-Reinsel. This is the Snakes and Ladders sweater. 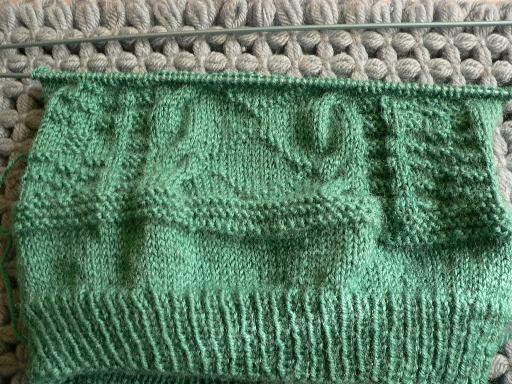 The first sweater is dark green. This one (above) is sea green, although it looks gray in the picture. It's really a nice color. Quick and easy and they actually fit. I also have a couple of UFOs (unfinished objects). 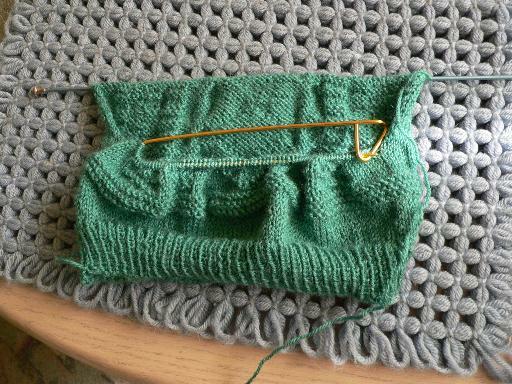 I have two pairs of socks and a sweater started for myself. I'll get to them when I finish these things, probably. The sweater is a fisherman style. I'll dig that out and take a picture this week sometime. I have one sock of one pair finished in a pattern I love. It's a Lion brand pattern called Joan's socks. They're quick and easy and so warm. 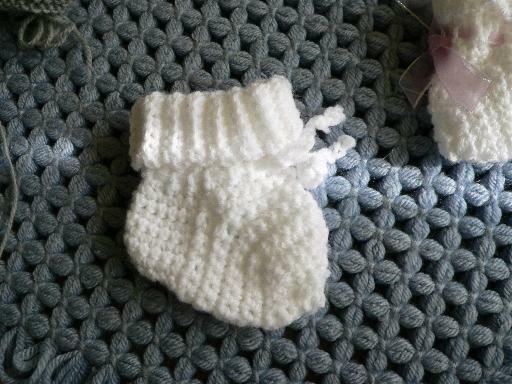 I've made myself at least four pairs of these already. 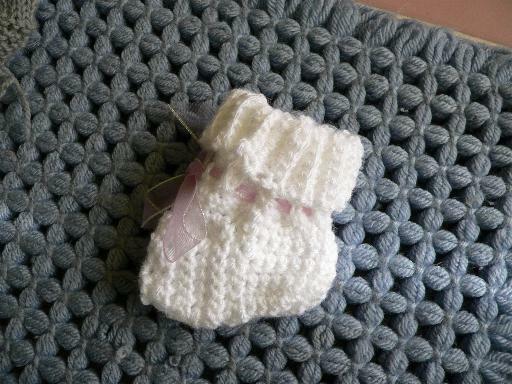 The other pair of socks is more delicate and time-consuming. That's not bad for me, really. I usually have lots of projects I haven't finished hanging around. I've been trying to make an effort to finish things recently. 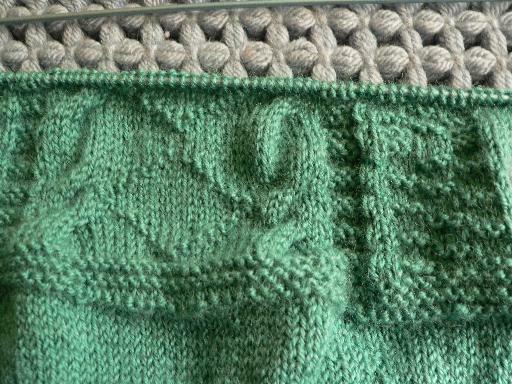 The fact that Lorelai will outgrow something before I finish if I don't get on it makes me get moving these days! It's really coming down out there. It looks to be around 6 inches now and it's going to snow all day with possibly an additional 6 inches. Wow. The timing couldn't have been better, though. A weekend and we're all home, safe and sound. Medically, the only option Christine has left is a Bone Marrow Transplant. The survival rate of this procedure is 30-40%. Of those who do survive the procedure itself, only 50% survive the next two years. However, if she does survive those two years, it means the cancer won't come back. This is a pretty terrible option. However, the non medical option is also horrible. Her doctor says that if she chooses not to have the Bone Marrow Transplant, she'll be dead within a year. This is hard enough for the average person. There are over 20,000 types of bone marrow, so the average person has a 1 in 20,000 chance of finding a match. These numbers are even worse for Christine. Because she is Filipino, she needs to find a donor of the same ethnic background, and there are hardly any Filipinos on the National Registry. Because we caught the cancer early, right now is our best chance of having the Bone Marrow Transplant work. Every day we lose her chances of surviving drop. You can reassure your friends that signing up for the registry does not require donating any bone marrow. If it turns out they are a match, they will be contacted, and can make the decision at that point about becoming a donor. There are lots of misconceptions about donating bone marrow. (I know I was terrified of doing it before I learned how minor the procedure actually is.) The procedure is simple and safe. You will be anesthetized the whole time, so you will not feel anything. When the procedure is over, you may have some soreness in the area for a few days and you may feel a little tired. That's it. The bone marrow you donate is replenished within 3-4 weeks. And again, you will only undergo this procedure if your blood sample shows that you are a match and you decide to donate, in which case the slight soreness you'll be feeling will be saving someone's life. All medical expenses for the donor will be covered by Christine's insurance. And as I mentioned before, if they contact me directly, I can put them in touch with an organization near them that will put them on the National Registry for free and also make sure they are listed as a Sponsor for Christine. Even if you aren't a match yourself, and even if you can't personally help Christine, please link to this post, and spread the word around. I know there are about a million of you who read this lame blog every month, and if just half of you make some effort to spread the word around, we may be able to help save Christine's life. Have a pleasant day, stay warm and dry if you're in the east. We kept her busy and took her out for a ride in the afternoon. Poor baby was tuckered out! Well, it's that time again. Time for my annual rant about groundhog day. Who came up with this anyway? For a little insight, here's an article on MSN that answers some of my questions. According to this article, the tradition started in England, with a holiday called Candlemas. The animal in question was a hedgehog but when the Puritans came to this country, they chose the closest animal they could find, the groundhog. It appears the groundhog gets it wrong 63% of the time. Not a very good track record, in my opinion. Of course, this annual nonsense is a tourist attraction ("one annual appearance in exchange for year-round maintenance and a signing bonus"). Let's face it. How accurate can this be when the press shows up before dawn with huge TV cameras and lights, someone pulls the little groundhog from his burrow and holds him up? These guys in the "inner circle" (Groundhog .org - the Official Site of the Punxsutawney Groundhog Club), apparently tell us if Phil has seen his shadow or not. How could he not see his shadow? He's surrounded by 400 lights and a whole crowd of people! If I were Phil, I'd run for the hills or, at least back into the burrow, just to escape this madness. So, anyway, it looks like six more weeks of winter, which is interesting because we've had so many warm days, there's an argument for the fact that we haven't even had a winter! Ah, whatever.